You can HOPE. HOPE for a brighter and more meaningful future. HOPE for a life free of substance abuse. You can STOP SUBSTANCE AB– USE NOW with the help from New Beginnings Counseling. Whether you abuse alcohol, marijuana, heroin, or prescription drugs, we are here to HELP you. Let us help you achieve your maximum potential by learning relapse prevention skills, and how to promote your own self-worth as you find your way to successful daily living. Everyone, including YOU, deserves to be treated with dignity and respect as they learn to manage their daily lives and maximize their individual potential. You can HOPE and we can HELP. 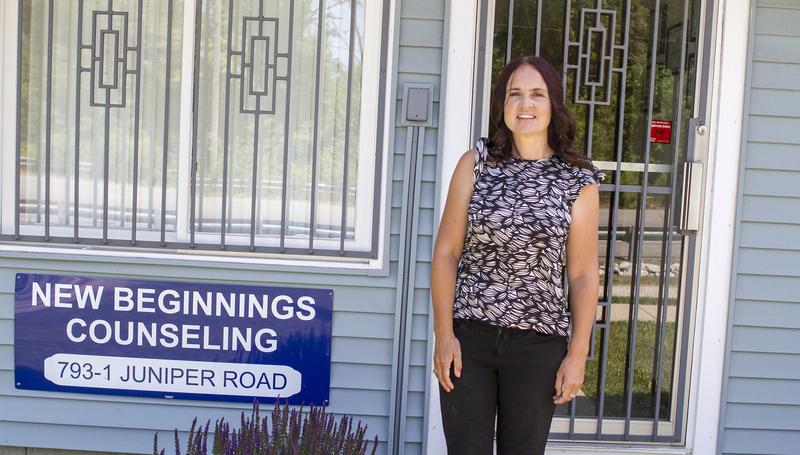 New Beginnings Counseling provides programs and counseling for adolescents dealing with substance abuse issues in Northwest Indiana, including Lake, Porter, and LaPorte Counties. Our experienced counselors have years of success in treating adolescents suffering from substance abuse. Our programs address individual client needs and provide solutions. Our goal is to provide relapse prevention skills with an emphasis on enhancing self-worth and achieving successful daily living. We treat each person with dignity and respect as they learn to manage and maximize their potential. Our counseling approach is based on cognitive behavioral therapy. Cognitive behavioral therapy emphasizes key concepts that rely on changing negative thoughts and behavioral patterns. This counseling approach has been very effective with chemically dependent clients. Adolescents are often in situations in which they will feel “peer pressure” which can lead to poor choices and can impact their overall functioning. The counselor will assist the clients by helping them develop positive thinking patterns to avoid participating in high risk solutions. We help our clients achieve and maintain sobriety. We help our clients learn and improve coping skills and life stressor skills. We help our clients develop relapse prevention techniques. We help our clients make better life choices and enhance the quality of their lives. The 3 groups that adolescents attend at New Beginnings consist of EDUCATION, RELAPSE PREVENTION and FAMILY. Education groups will initially discuss the consequences of teen drug abuse. Research has shown that adolescents appear to suffer more brain damage from mood altering substances than other groups of drug users because the brain is not fully developed until the age of 25. We also discuss the issues relating to low self-esteem. This is more likely to develop as the addiction progresses. The material presented on this topic will review information on low self-esteem and determine if this is an ongoing problem or is directly related to the use of drugs and alcohol. Discovering the source of the low self-esteem will give the clients a better understanding of how to evaluate this more thoroughly. We also learn about recognizing the symptoms of substance abuse and dependence. Clients need to be informed about understanding the difference between alcohol abuse and chemical dependency. Relapse Prevention groups discuss issues that are related to reoccurring relapses. The stages of relapse consist of; emotional relapse, mental relapse, and physical relapse. These three categories, if not corrected and recognized, can lead to irrational choices. Emotional relapse occurs when one’s emotions are “off kilter.” Mental relapse is the psychological component that is difficult to change. Physical relapse entails actually obtaining alcohol or drugs. Some his risk situations are described by the acronym “HALT:” hungry, angry, lonely, and tired. High risk situations can jeopardize your sobriety. Some areas to be cognizant of avoiding are; people, places, and things, and giving our clients the tools to do that. Family groups are ideal when family members are involved and present in their child’s recovery. Unfortunately most parents are not involved with the treatment process. In the beginning, we discuss the five stages of family adjustment. 1). The first phase is denial. 2). The second phase is controlled drinking or drug use. This occurs when a child or teenager withdraws to hide their problem. 3). The third phase is acceptance, marked by a “what’s the use” attitude from the addict or alcoholic. 4). The phase is reorganization when the child or teenager is isolated from the rest of the family and not included in family functions. 5). The fifth phase is recovery action. Also in family groups, we review the “five family adjustments.” This is important to discuss because it entails the different stages that parents have to confront, from the initial stages of an adolescent’s addiction, to the end of the process. Peer Pressure is also a key concept to discuss and review with teenage clients. Our Counselors will suggest and recommend that adolescents join a sports activity to get involved with something positive. We practice assertiveness that so our clients can react to pressure to use alcohol or drugs. We help teenagers create a better strategy and plan to deal with peer pressure. As Counselors, we make sure that we discuss with, and educate, our teenage clients about the nature of progression as it relates to drug use. New Beginnings accepts most Medicaid Packages, visa, debit cards, checks, and cash. Initial Evaluation: $75.00 Individual Counseling Sessions: $70.00 Group Counseling prices vary depending on the Group. Exit Interview: $70.00. Sarah, a long-time resident of Valparaiso, Indiana, is a Licensed Clinical Abuse Counselor. Sarah holds a B.A. in Human Services from Calumet College of St. Joseph in Whiting, Indiana and a Masters in Clinical Mental Health Counseling from Valparaiso University. Sarah is licensed by the State of Indiana Family and Social Services Administration Division of Mental Health and Addiction as an Addictions Counselor. Sarah’s professional experiences include working at Moraine Halfway House in Valparaiso, Northwest Indiana Treatment Center in Merrillville, Edgewater Mental Health Facility in Gary, and Porter-Starke Counseling Services in Valparaiso. Currently Sarah is a substance abuse counselor at New Beginnings, Inc., a counseling center for children between the ages of 13 and 17 with substance abuse problems. Sarah is also a substance abuse counselor at Care Counseling Services, an out-patient center for adults suffering from substance abuse issues. Sarah’s vast experience allows her to create individual treatment plans for her clients. Sarah also serves on the Porter County Substance Abuse Council. Give New Beginnings a call at (219) 203-2343. Our Hours vary, but someone is usually in the office Monday, Tuesday, and Thursday.